I’ve been meaning to write this one for a fairly long time, since August actually. But seeing as how I took 104 pictures, getting them all organized, uploaded and labelled seemed like a daunting task, so I did what anybody else would do, I put it off. Until today. If you click through to see all the pictures, it’s going to take a while to load, sorry in advance. 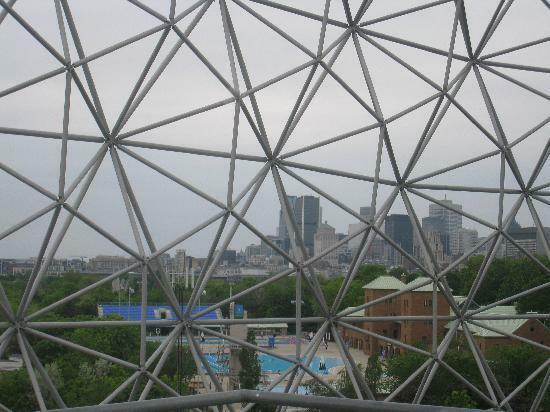 In short, since the Biosphere is an “Environment Museum” it only makes sense that they mount exhibits designed to promote environmental awareness. And some bright wag decided to commission 16 clothing designers (I think all women) to create dresses using refuse material. Now while I am an environmentally aware person and keep a fairly sustainable lifestyle, I’m not big on preaching about it. As a consequence what really struck me about this exhibit was not its Green-ness, but that while everyone was going gaga over the Jean Paul Gaultier exhibit at the Musée des beaux-arts de Montréal here was a truly original fashion exhibit that was not getting any press anywhere. And while I might not proselytize about sustainability, like certain people, I do champion the underdog and Outfits from a New Era at the Biosphere is definitely underdog material if there ever was. The museum probably counts the number of daily visitors in the high two figures, has some breathtaking views of Montreal and is a charter member of the Cult of Bucky. What more do you need? Anyhows, while I do not consider myself a fashionista, nor an authority on fabrics and style, instead of viewing these as liabilities I figured (like usual) that instead, if I approached this as a learning opportunity it shouldn’t be a hindrance to writing about it and taking some pictures. Right? To me it was more of a compare and contrast situation. While it seemed like everyone and their mother was raving about how original and inventive M. Gaultier’s dresses were, here were some truly original and inventive dresses that weren’t getting any attention whatsoever. And while I’m certain that at some point M. Gaultier did in fact actually touch the dresses on exhibit that bore his name, I’m fairly convinced that he didn’t actually do much (if any) of the sewing, knitting, weaving, embroidery or any of the other tasks involved in making the dresses. If I’m going to make one complaint (actually as I’m less than halfway through, I imagine that there will be other complaints, let’s just call this one the first. Which is not to say or suggest that the exhibit is bad, just that there is always room for improvement). This contemporary fad, or what I hope is a fad, for Dramatic Lighting! (with the capital “D,” capital “L” and an exclamation mark) drives me up a wall. In general when it comes to art/culture/things to look at or watch, you have two choices if you’re indoors; A white cube or a black box. White Cubes tend toward being bright and Black Boxes (as you might expect) tend to be dark. Since they are dark, the Black Boxes use highly focused spotlights to draw your attention to stuff that the exhibition designers want you to look at. In contrast to the White Cube where, for the most part, your eye is free to roam where you wish. If you haven’t figured it out yet, I can’t stand exhibits that are housed in Black Boxes. And Outfits from a New Era is, unfortunately in a Black Box, pity. I don’t know if it is because my eyes don’t react well to large contrasts in brightness, or if because I’m in darkness for the most part I don’t get the nuances of color as well as I would if it were brighter, or if it has something to do with my glasses. But whatever it is, Dramatic Lighting! (with the capital “D,” capital “L” and an exclamation mark) bugs the heck out of me. I think you can see what I mean by a lot of nuance being missed because of the Dramatic Lighting! (with the capital “D,” capital “L” and an exclamation mark) in the picture above. Light Flow By Chloé B. Fortin is a light, wispy and diaphanous something or other that to my mind would be appropriate in a boudoir or a pornographic film shoot. Apparently made from 2,500 light bulbs and 66 meters of stripped copper wire. One of those garments that professes to show more than it hides, in French it is called “le grand courant lumineux” or in a hackneyed translation “the great current of light,” it was initially called “Le grand souffle” which has more to do with breath and wind than electricity. Which gives a much better idea of the “wispy and diaphanous something or other nature” of the garment. You can see better detail pictures here> I’m fairly certain that it doesn’t light up or get illuminated from within. But beyond the wispy nature of it, I’m not quite certain what to make of it. While the use of the light-bulbs is alright, there isn’t really anything in it beyond the use of non-traditional materials that pushes any boundaries. And given what has been already done with LEDs and clothing, I’m inclined to think that’s it’s kind of like the clothes your sister’s friend in high school wore. Something designed to make her look good, not making any real statements and not that different from what everyone else was wearing. This little frock caught my eye, although I don’t know if it was because it’s black, and as you know, black is the new black. Or if it was because it was strapless and since I am not y-chromosome challenged, bare shoulders always make me shiver slightly, even during the summer, even on a faceless mannequin. Or what. I’ll leave it up to your imagination. Anyhows, this was the first one, where I thought to myself: “I’m not so certain that they actually used stuff from the garbage to make this…” Seeing as how it is made from those plastic bags you take with you when you’re walking your dog and you’re playing State Farm and being a good neighbor and picking up after your dog and everything. None the less, I like how it incorporates the paw print motif from the bags, is over the knee and has some sort of petticoat action happening. Kind of like being post-modern and anti-nostalgic at the same time.